This is a post that has been in draft status for way too long… Time to get this published! Ok, so this was our first time cooking a giant turkey for Thanksgiving. 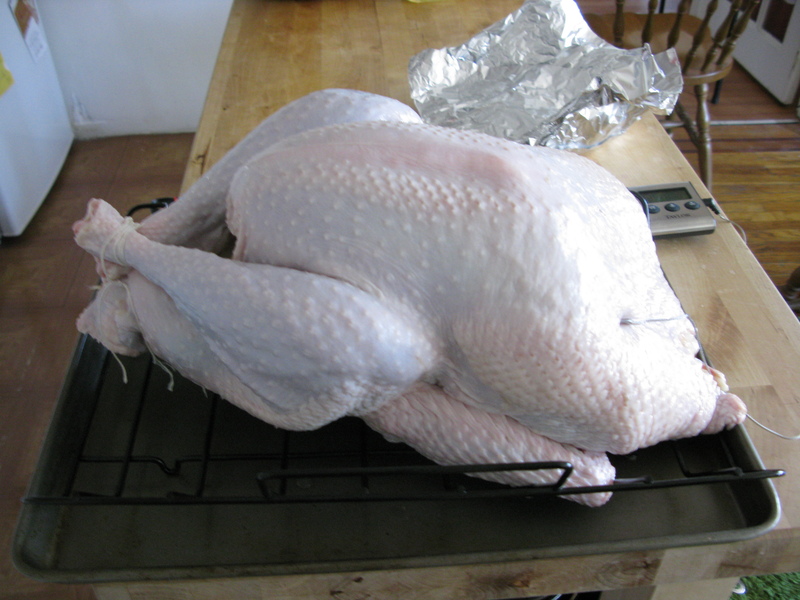 We got a gorgeous 15lb Heritage Turkey from Friends & Farms. These birds apparently have less breast meat and are a bit leaner, so the cooking time was really not that long. Our biggest worry really was making sure that the bird would fit in our tiny oven (which it did, but the tray I bought to cook it with didn’t, so we had to improvise a bit). Now, for the recipe. Alton Brown’s “Good Eats” thanksgiving episodes were the big base for our cooking. The recipe I followed can be found here and I can’t recommend it enough. The turkey was delicious and juicy, and it cooked in just 3 hours (we actually took the turkey out of the oven right about the time the first few guests arrived). Our turkey was never frozen, so we didn’t have to thaw it, we just put it straight into the brine Thursday morning and we let it sit for 3 hours. Then we cleaned it, put it in the tray, and put the aromatics inside. According to Mr. Alton Brown, “stuffing is evil” – it increases cooking time and in order to ensure that it’s cooked through, you end up overcooking the turkey. So the aromatics are just for flavor. After that, just a pat with canola oil, the termometer was put into the breast and to the 500F oven it went. After 30 min, the temperature was reduced to 350 and the breast was covered with foil (the dark meat cooks more slowly, so it helps making sure everything finishes cooking at the same time). As I said before, the turkey got out of the oven as the first few guests arrived. We let it rest for a half hour, while making the gravy, and then Jeff did a great job of carving it. Only problem was… we forgot to take pictures! So here’s a picture of the reheated turkey the day after. Next to it are some mashed potatoes and sweet potato casserole. But we aren’t done! Since we didn’t use the innards for stuffing, I decided to use them, some leftover meat and the carcass to make delicious turkey soup. The soup was so flavorful, it was better than any of this kind I’ve tried. It did have a bit too much grease (all from the bird, that’s how good it was), but I used a trick my mom taught me a long time ago. After the soup has been heated and right before eating, add some lemon juice (to taste) and mix. This entry was posted in Meat, Thanksgiving by Ines. Bookmark the permalink.